Asia can be a difficult and challenging place to organize a family trip. Indeed, most of our family tours we plan are typically for families using someone to organize their trip for the very first time. They are in good hands. 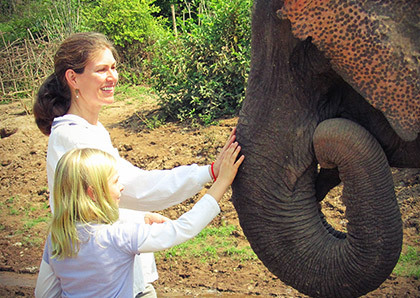 We've organized custom family tours in Asia for over 20 years, pioneering new destinations including Vietnam, Cambodia, Laos, and Myanmar and even if you don't consider Japan daunting (it can very much be so), your family will delight to the unique places, immersive activities and authentic encounters we've planned not only for the kids, but parents too. We'll organize your trip from international airlines, arrival through departure, handling every detail, including expedited immigration, visas, hotel check-ins, dining and more, all under the watchful eye of a dedicated, local in-country trip manager. Most importantly, enjoy a private trip for just you and your family for about the cost of a group tour. Asia family travel has never been easier or more enjoyable. What's to know? 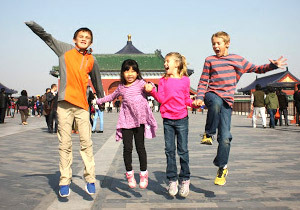 Asia is not only the most thrilling place to travel with your family, but a very safe and comfortable destination for traveling with kids of all ages. Family tours are our favorite—we travel with our children throughout the region and have been hosting families with children of all ages since 1993. Nobody else has as experience, contacts, nor our knowledge and meticulous attention to detail. Contact us and find out. Ask us the really tough questions. 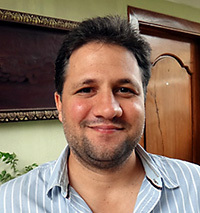 On your trip, our in-country local staff, many who have been part of our team for over a decade (Patrick Chase, right, in our Cambodia office) most whom also have children, will ensure your trip will not only go smoothly, but will be in daily contact throughout your trip. 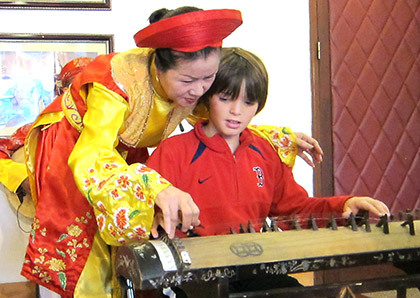 Our Asia family tours provide an endless stream of fascinating sights, adventurous outdoor activities, stunning landscapes, exotic animals and marine life to encounter, exceptional learning experiences (including school visits), and opportunities to volunteer on activities and local projects will keep kids of all ages engaged. 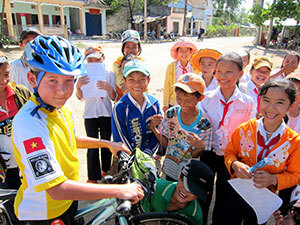 Throughout Southeast Asia, people are helpful and friendly, and adore children. For families traveling with toddlers to teenagers, to young adults, we will be sure to match your family with activities and locations that will not only excite and entertain the whole family, but will be remembered as the trip of a lifetime. 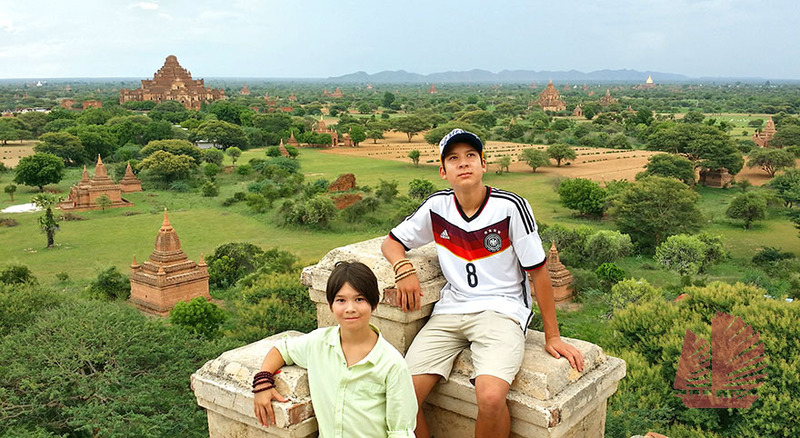 From the bustling city life of Bangkok to the lazy rivers of Laos, hiking between the wild monkeys high on Mount Popa in Myanmar (right), feeding elephants in Thailand, staying at monastery on sacred Mount Kōya in Japan, and spying on Giant Pandas in China, there are many spots and exotic sights in Asia that are perfect for keeping kids happy and amused, while still allowing parents to get in the relaxation and vacation time they need. The following is a list of some of the best places for Asia family travel, to visit with the whole family on one our custom family tours. "At night we walked through the busy night market that had really strange things like a "fish spa" where fish eat the dead skin off your feet - it was super ticklish!" Where to travel to Asia with family? Our family tours of Vietnam should be at the top of your list! We can't recommend Vietnam enough, if you can choose only one place to travel in Asia, Vietnam should be your destination. Nowhere on Earth is there a more fascinating and engaging destination, nor people who are among the most exceptional you will ever meet. We've escorted kids of all ages since 1993 organizing biking, kayaking, light trekking, camping out in hilltribe villages, with unique activities such as hands-on rice planting or learning hands-on how to create traditional lacquer guided by a leading artist. 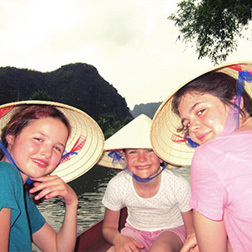 Our staff, in fact you'll discover almost all Vietnamese, are "kid crazy" and your children will enjoy one of the most remarkable trips they've ever had. Take in a bit of history just outside Saigon, where you can visit the intriguing Cu Chi Tunnels where South Vietnamese fighters lived in these underground tunnels for years during the Vietnam War, and even had doctors and stores set up under the ground. This is a sobering and educational reminder of the dangers and hardships of war. We'll also expose you to living history, meeting with fighter pilot Mr. Hong My in his Hanoi Old Quarter home to hear of his dogfights above Hanoi during the war. For a more light-hearted trip, we'll head to the mountains in Sapa in the far north of the country. Here you can trek through emerald-green rice terraces and meet friendly local groups who still retain their unique culture and traditional ways. 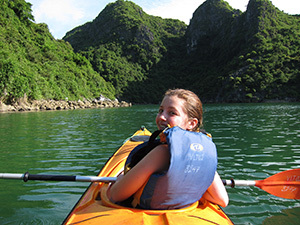 If your family enjoys active travel, will love kayaking through the stunning karst landscapes of Halong Bay. Just two and a half hours outside of Hanoi is one of the world's most incredible geological settings. Here, you can paddle past towering limestone karst formations and traditional Vietnamese wooden junks. The waters are very calm here, and a pleasant for boating and kayaking with children of all ages and ability. 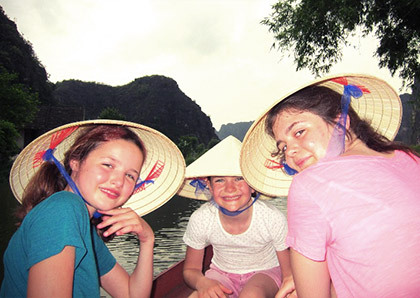 Come experience the very best of family travel in Vietnam with Indochina Travel. Please note hotels and flights for December high season begin to fill by the end of July and early August. No trip to Cambodia is complete without a visit to Angkor, the world's largest collection of ruins and once the greatest city on Earth, a vast Khmer empire which was ruled by Angkor, which at its apogee, was a city of over one million people with the massive Angkor Wat at its center. Children will love playing Indiana Jones amongst the crumbling ruins, where massive trees intersect temple walls a la Tomb Raider, and where vivid bas reliefs tell legends of Hindu epics and village life thousands of years ago. Within the temples, we organize exclusive, private access before dawn and the tour buses are allowed into the complex. 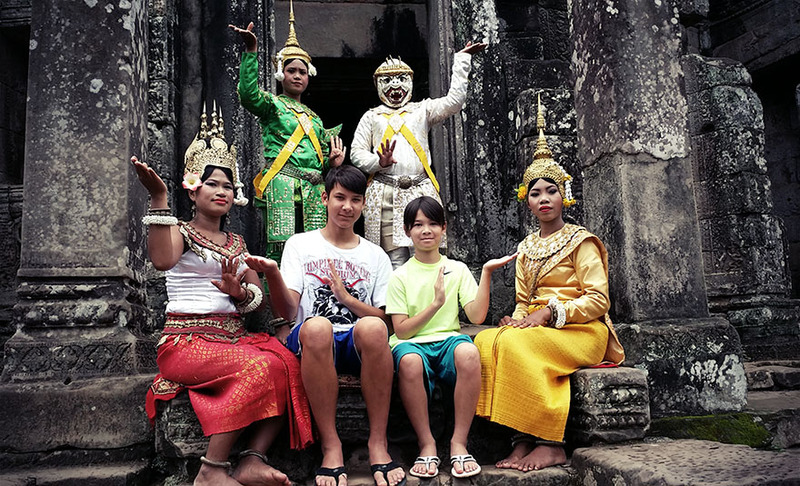 We also plan some adventurous, fun family activities, such as our Angkor scavenger hunt. authentic Khmer cooking classes with a top chef within a private traditional home, and immersive, meaningful activities including teaching English for the morning in a rural village. Liek everywhere else we organize trips, cycling is always an option, enjoying a dawn spin around the temples before other tourists arrive is a magical experience. Siem Reap, the nearby town once a base for exploring the temples has come unto its own and has evolved into one of the most pleasant and exciting small towns in all of Asia. In the evening, the town comes alive with night markets, sidewalk hacky sack and volleyball, cafes resembling those from a past era, and the exciting Phare children's circus, an astounding acrobatic and drama show. Although Angkor gets most of the attention in Cambodia, the beaches of Sihanoukville are a particularly pleasant place to spend a few days as well. The golden sands are perfect for catching some rays, and kids can go swimming, snorkeling, or play a game of pick up soccer on the beach with the local children. The Snake House Restaurant will fascinate kids of all ages for its collection of various snakes from around the world, some of which sleep in special enclosed glass tables in the dining room. Travel into an Asia of decades past, through one of the most untouched places in the world. Sublime, tranquil, picturesque and home to an endearing and gentle Buddhist Burmese, there is no place quite like Myanmar. Yangon is home to the stunning Shwedagon Pagoda, a massive stupa decorated in thousands of sheets of gold leaf, and in the former capital we'll arrange for your children to meet with a fascinating puppet master who will teach them the art hands-on. On Bagan, at sunrise floating high over the temple plain on a thrilling balloon ride. Nearby, meeting with young monks in their monastery to learn about their unique lifestyle. 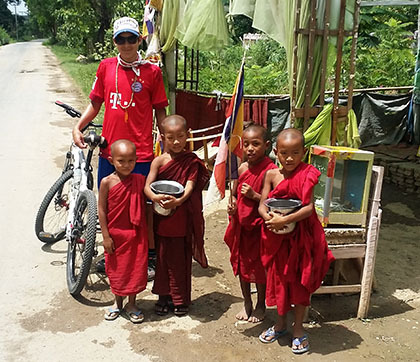 Bagan and Inle Lake also provide a wonderful backdrop for leisurely family biking. Inle Lake is one of our favorite destinations in all of Asia for family travel. A diversity of colorful hilltribes inhabit the area, including the "long-neck" tribe. We'll hike to villages and meet with local people while boating around the sublime lake. Among the traditional craft shops, including a hand-loom textile factory, children will marvel at the variety of attractions such as a floating monastery where the resident monks have taught resident cats to jump through hoops and the Burmese Cat Breeding Village. With China, Vietnam, Cambodia and Thailand on your borders, it's no wonder Laos gets no attention. An therein lies it's charm. The least populated country in Asia is also one of the most undeveloped, a Golden Triangle of 20 years ago. Laos is a very peaceful country to visit with smiling, welcoming locals, and plenty of natural beauty to explore. Luang Prabang (our favorite small town in all of Asia) is the focal point for our fascinating cultural adventures in the region. 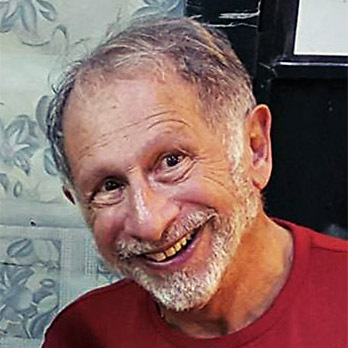 We'll visit with a local family in their home for a baci welcoming ceremony, a Lao tradition for centuries, strolling the pleasant, traffic-free streets and alleys of the old city, visiting with novice Buddhist monks in their gilded temple, and spend private time with a rare Asian elephant in a sanctuary outside of town where we'll learn about how the project is saving the elephants, and the care and feeding of the gentle giants. There are few places more beautiful and enjoyable for a dinner cruise than along the Mekong, which lazily meanders past Luang Prabang. 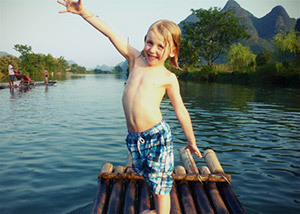 Further afield, children will enjoy picturesque Vang Vieng where by inner tube you can float down the lazy river, stopping every so often at riverside stalls to buy fruit juices for the kids and a perhaps a chilled beer or two for Mom and Dad. The surrounding karst peaks are ideal for mountain biking and we can arrange cycling through local villages to experience life in the area. The Four Thousand Islands region is another scenic spot where the islands are so small you can cycle around them in a day. Stop off at picture perfect waterfalls, take refreshing dips in the rivers, or visit ornate and colorful Buddhist temples among the rice fields. At night the electricity goes off early, so this is a great place to show the kids what the stars actually look like when they are not obscured by big city lights. There's no place quite like Japan, a place of immense natural beauty with spectacular peaks, forests, lakes and waterfalls, where offshore islands cradle exquisite beaches. But even in the humming cities, one can find immaculate, manicured Zen gardens, tranquil ryokan, and sublime ritual such as tea ceremonies. Japan is also, with few exceptions, the most fascinating and thrilling of all destinations for children, exploring the legacies of the feudal system and samurai warrior, colorful Harajuku girls, amazing technology including futuristic robots, world-famous animation, massive toy arcades featuring Hello Kitty, Pokemon and other children's favorites, and a 1-story sports complex where kids can play a different sport on every level. 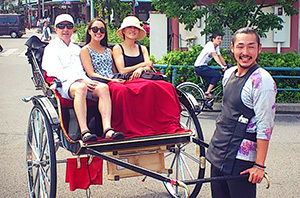 Enjoy unique activities we can plan, including a visit to a private sumo stable where children can learn hands on the ancient art, a Kyoto studio where children can train to be a ninja, and family cycling along the beautiful, remote northern coast where few travelers ever venture. During your family trip, discovering the rich cultural highlights of Japan's capital city, enjoying an in-depth exploration of the dynamic sprawling metropolis, Tokyo, experiencing the astonishing contrast of ancient and modern and venues no other place in the world has. Thrill on a ride aboard a famed bullet train to Kyoto, city of an astonishing variety of UNESCO World Heritage sites. 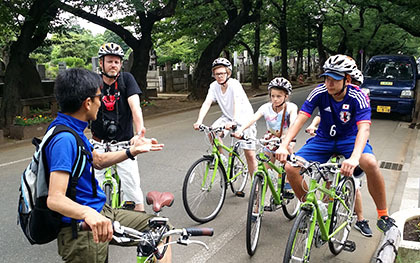 Children will marvel at ancient castles, enjoy a delightful bicycle excursions along the Katsura and Kamogawa Rivers, and play ninja at a ancient home of ninjas. 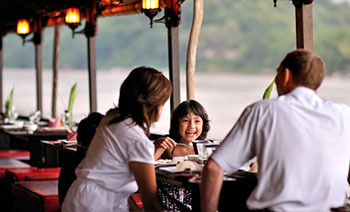 Thailand is the most popular destination for family travel in Asia. Aside from Japan and China, it is the most developed of countries we organize trips in, making it an ideal first destination to visit to Asia. World-class islands, elephant camps, safari parks, colorful hilltribe villages, fabulous cuisine, Asia's best shopping, legendary hotels, and famously friendly Thais make Thailand one of the most popular travel destinations in the world. Bangkok can be a bit hectic at times, but there are countless things to do in this sprawling metropolis for children of all ages. Kid-friendly attractions such include the Dusit Zoo, with lions, tigers, hippos, and ostriches, the Butterfly Garden, where little ones can frolic amongst the 500 species of colorful butterflies, or Siam Ocean World, where kids will love the various sharks, sting rays, and turtles on display. Further afield (and away from the traffic), Chiang Mai is a great destination for the whole family. 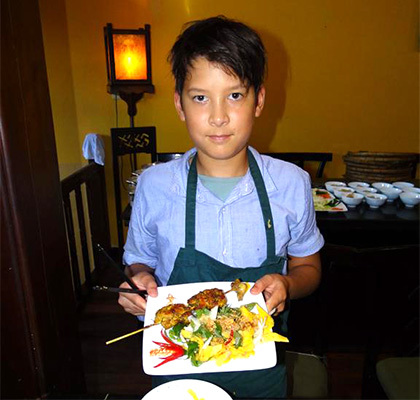 Here parents and kids can take a cooking course that includes a trip to the local market, a hands-on cooking session, and a lunch where you get to eat your own creations. Visitors can also ride elephants at the Maesa Elephant Camp or fly through the treetops past gibbons on the Flight of the Gibbons zip-line trek. Kata Beach and Karon Beach in Phuket are about as family friendly as it gets, with soft sandy beaches, calm waters, and a plethora of restaurants and cafes that serve everything from spicy Thai dishes to hamburgers and French fries. Kids and parents can go snorkeling and diving, or practice their golf swing at the unique Dino Park Mini Golf theme park. Older kids? Nobody ever forgets a Full Moon rave party on the island of Koh Phangan (while parents enjoy the tranquility of Koh Samui, a short ferry ride away). For more detail, read our Top Ten things to do with kids in Bangkok (okay, actually 14 things). Ask us what makes out Thailand family tours unique. 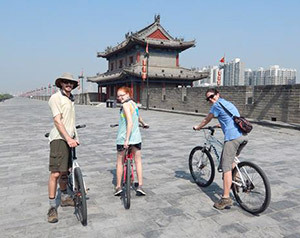 The Middle Kingdom offers an unparalleled depth of culture and history, but our family trips will take you beyond the Great Wall and the terracotta warriors. In Beijing, visit the ancient hutongs, enjoying a thrilling rickshaw ride and visiting a local family to experience what their life is like. 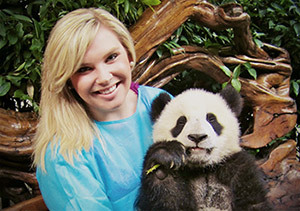 We'll also visit the zoo to spy the famous Giant Pandas (or we can plan a visit to the famous research center in Chengdu for a more personal encounter). No visit to China is complete without Jiaozi dumplings, and children may learn to cook them during your time in the capital or in Xi'An while visiting the famous warriors. 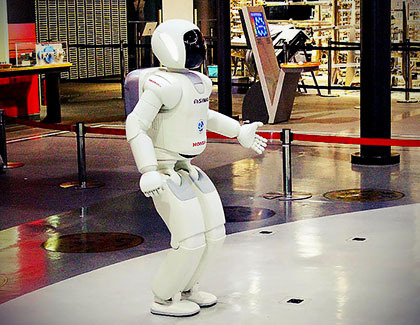 In Shanghai, your family will marvel at the contrast of the past and future, visiting a game applications company to learn about young Chinese and their high-tech acumen. For older children and young adults, let us plan visits with younger entrepreneurs and students at Beijing University that will provide insight into the rapid rise and future of China. After Beijing and Shanghai, come explore the astonishing landscapes of Yunnan, a province with 2/3rds of the country's biodiversity. Here is bucolic hiking and cycling through villages in Yanghsuo, cruising through the karst wonderland of the Li River on bamboo rafts, and overland from picturesque Lijiang to the high-mountain Tibetan plateau and Zhongdian (Shangri-La). Ask us about recommendation for your family travel in the Middle Kingdom. 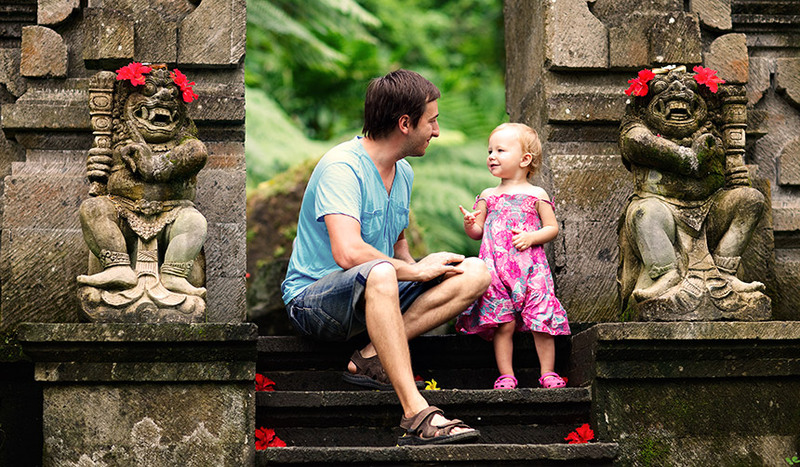 Bali is a Paradise not only for adults, but even more so for children. Moreover, in Balinese culture, children are cherished as kings and queens and the Balinese always make families welcome as honored guests. 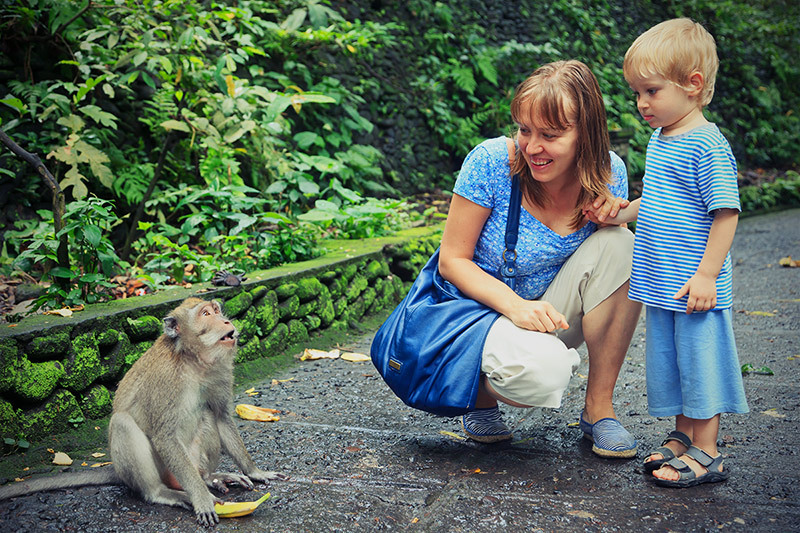 Bali provides a magical, tropical wonderland for kids, with an exotic setting of temples straight out of an Indiana Jones' movie, with monkeys rambling through the jungles, colorful local cultures, and multitude of pool, beach, and ocean adventures. Activities with the kids include exploring the Monkey Forest where children will delight in viewing and feeding monkeys close up (below). At Pirates Bay in Nusa Dua, children can enjoy dinner in a tree house or pirate ship with other activities including flying by zipline and treasure hunting. 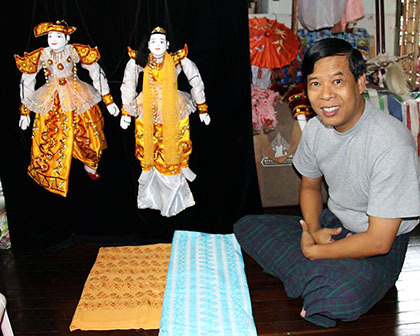 Traditional puppet theater, as in Vietnam and Myanmar (Burma), is still practiced for entertainment as well as ritual purposes in Bali. In Bali, often called "shadow puppets," Wayang means traditional puppet. and it is also spread over most of Indonesia as a theater show since ancient times. Based on old manuscripts in Bali, Wayang has been performed since around the 9th century and children can learn how to control the puppets hands-on. 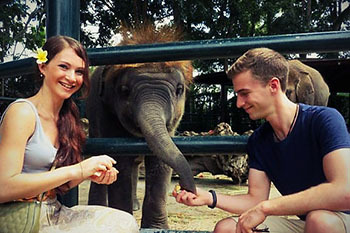 Animals abound at Bali's Elephant Park, Safari Park, Bird Park, and Reptile Park. At the Elephant Park, get up close and personal with these gentle animals in a beautiful tropical park setting. Elephants can be seen immersing themselves in the park lake, and your family may learn about hands-on about the special care of the animals, feeding, bathing, and other needs of the rescued elephants. 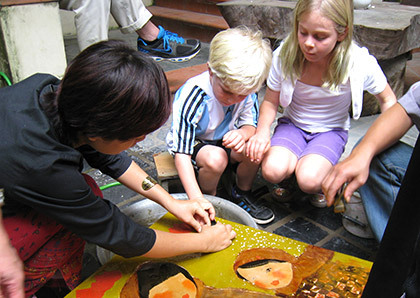 Children may also learn traditional painting and wood carving, hands-on with local artisans or playing the Gamelan with instruction from a musician. Children from a local village may also come to the teach your children Legong dance lessons, a delightful experience. 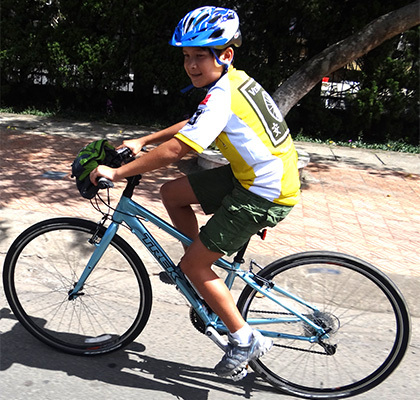 Family biking in Bali is a must with gentle to more moderate rides through the magnificent scenery on small, quiet roads, dirt paths, passing palm fringed rice villages, terraced fields and jungle canopy. During our bike trip, stop to visit a local chocolate factory! Whether diving in Sanur, Nusa Lembongan, Tulamben, Pemuteran or with giant turtles in Gili Trawangan, if you want your kids to start to share your diving experience with you, there are diving programs from 8 years of age, and can take their Open Water Diving license from 10 years of age. Surf's up. Bali is legendary on the world surfing circuit, and one look at the ever-changing seas below will tell you why. The world-famous Bukit Peninsula boasts over 20 top-quality breaks on the southwest and southeast coasts of the island. Some of these, like Padang Padang and Bingin, are world-class reef-breaks. 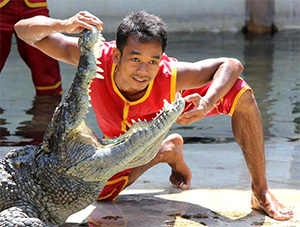 Lessons are provided for those who want to give this thrilling sport a try for the first time. Like Hawaii, Bali offers many gentle waves to learn surfing or to challenge you and you children on bigger sets. At Pondok Pekak children can learn learn traditional crafts and arts, including wood carving, batik painting, and Balinese style dancing. The aqua park Aqualoop in Waterbom boasts 17 water slides (best on weekdays to avoid crowds).